With four Mad Rock pro athletes placing the U.S. Team for the upcoming World Cup event, this years Nationals was a blast! 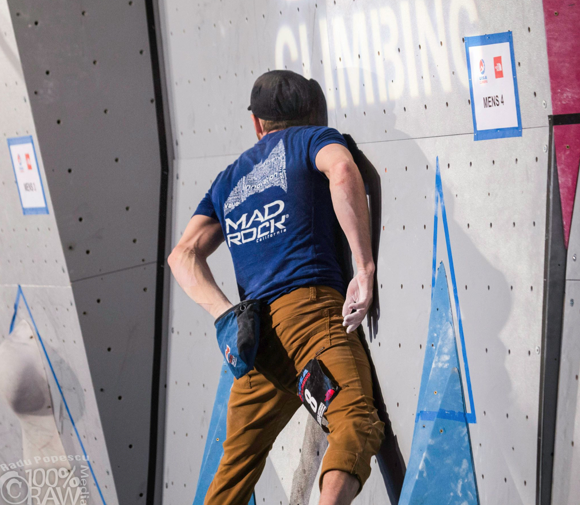 As with most high profile competitions, it’s always reasonable to expect the unexpected when it comes to the line up of climbers competing for the podium. With Mohammad Jafari Mahmodabadi (a relatively unknown climber from Iran) taking first place, this year was truly anyones game. Additionally, an entirely new scoring system was in place adding some excitement and a bit of controversy. And, apart from the fact that I incurred an unexpected forearm injury in the qualifiers round, there was never a dull moment and I enjoyed ever minute of it! Competing with an injury: Over the years I’ve witnessed great climbers competing with serious if not down right painful injuries. Until this years ABS Nationals I’d been fortunate enough to climb through many a competition unscathed. But it’s inevitable, sooner or later something was bound to get tweaked. When the climb clock is ticking and the crowd is behind you it’s easy to be swept up in the heat of the moment, find yourself death griping the wrong hold, or pushing through a difficult move while out of sequence. It was on men’s problem three in the qualifiers round I found myself stuck in a rose move, griping an awkwardly angled pocket, and deciding where to go next. In a competition where every fall can and does count, I chose to bear down, unwind, and stick the next move. Naturally it wasn’t until the adrenaline wore off and I was back in the chair waiting for the next problem that I realized I had an injury. Reassessing goals: Perhaps the best insight I gained from this competition was practicing goal reassessment in the midst of a high stakes comp. It’s good to know when to shift gears, not give up, or give in. A head space check is vital. What did I train for? Why am I here? I realized that behind the Nationals podium was my ultimate goal of competing in the Vail World Cup. With my headspace checked and goals reset, I was free to focus my attention on making the U.S. Team. Placing U.S. Team: Warming up, the morning of the semi-finals, I found I wasn’t able to grip crimps or pinches with my left hand. In a way, my chance of placing well seemed impossible, but I have learned that in competition climbing anything is possible. Problem after problem became milestones of psych as I found each new route not only suited to my style of climbing but miraculously devoid of left hand pinches or crimps. Of course there were moves that felt terrible and holds that were harder to grab, but I was focused on what I could do, not with what I couldn’t. I placed well, climbed with everything I had, and came away stoked. Sure it’s going to take some healing time to get my forearm back on track, but ultimately I accomplished what I trained for, keeping my headspace in a positive place, placing high, and climbing my hardest-even if that meant having an injury. Now it’s time to refocus and attune my intentions towards my next goal.